This section covers your obligations to register your motor vehicle and to be covered by Third Party Insurance. All motor vehicles that are driven on South Australian roads must be registered. This involves the payment of a fee, which includes a component to cover Compulsory Third Party (Bodily) Insurance. AAMI, Allianz Australia Insurance Limited, QBE Insurance (Australia) and SGIC provide CTP insurance for vehicles registered in South Australia. In the event of a road accident resulting in personal injury, please phone the South Australian CTP Insurance Personal Injury Helpline on 1300 303 558. After reporting the crash, the owner, person in charge or the driver of a motor vehicle involved in a crash, have a duty to cooperate fully with the approved insurer in respect to providing the information required to process any claim. Penalties apply if this is not done (Section 124 of the Motor Vehicles Act 1959). This will include (in the case of the owner) a duty to give the approved insurer access to the vehicle, or part of the vehicle, on reasonable terms and conditions. This obligation is separate and distinct from any other obligation, such as reporting the crash to police. This insurance covers any damage caused by you to another person's property (e.g. their car), but not your car. It is relatively inexpensive and can be arranged by individual vehicle owners directly with an insurance company of their choice. If your vehicle is not covered for Third Party (Property) Insurance, you may have to pay the repair costs for the other person's vehicle if you are responsible for a crash, and these costs can often be very high. This insurance covers you for Third Party (Property) Insurance and will also pay for the damage to your own vehicle (even if the crash was your fault). You must not drive an unregistered motor vehicle or vehicle without CTPI insurance (uninsured vehicle), or allow an unregistered or uninsured motor vehicle to stand on a road. You must not drive a motor vehicle on a road unless a number plate or plates that bear the number allocated to the vehicle are attached to the vehicle. Number plates must not be altered in any way. The vehicle must not carry a false number plate. Number plates must be visible from the front and rear of a motor vehicle and must not be obscured by a tow ball, load, plastic cover, dirt build-up or any part of the vehicles bodywork. A bicycle rack attached to a motor vehicle, and any bicycle on the rack, must not obscure the rear number plate of the vehicle. You must not display a standard number plate on both the rear of a motor vehicle and on a bicycle rack or display homemade number plates. Bicycle rack number plates have the same registration number as your motor vehicle and cannot be used on any other vehicle. When carrying bicycles on your rack, you must attach an additional brake light if the brake lights on the motor vehicle are not visible from a distance of 200 metres (under normal weather conditions). Penalties apply for not complying with registration and number plate laws, for example obscuring a number plate or driving unregistered. 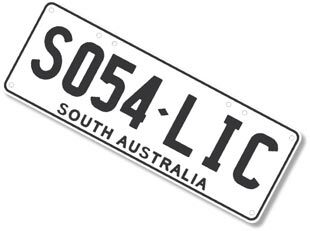 Vehicles registered in another Australian State or Territory can be driven in South Australia. The vehicle must display the registration requirements of the interstate issuing authority if required, e.g. a current registration label or certificate, card, permit, plate or plates and it must have valid compulsory third party insurance. If you have moved to South Australia you are required to change the registration over to South Australia within 90 days.